Not to be confused with Quercus robur. Quercus rubra (syn. Quercus borealis), commonly called northern red oak or champion oak, is an oak in the red oak group (Quercus section Lobatae). It is a native of North America, in the eastern and central United States and southeast and south-central Canada. 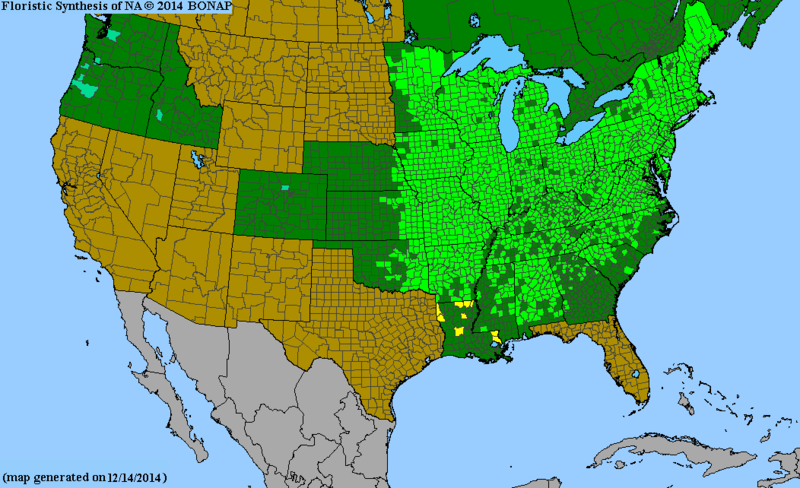 It grows from the north end of the Great Lakes, east to Nova Scotia, south as far as Georgia, Alabama, and Louisiana, and west to Oklahoma, Kansas, Nebraska, and Minnesota. It has been introduced to small areas in Western Europe, where it can frequently be seen cultivated in gardens and parks. It prefers good soil that is slightly acidic. Often simply called red oak, northern red oak is so named to distinguish it from southern red oak (Q. falcata), also known as the Spanish oak. It is also the state tree of New Jersey and the provincial tree of Prince Edward Island. Wood of the Red Oak. From Romeyn Beck Hough's fourteen-volume work The American Woods, a collection of over 1000 paper-thin wood samples representing more than 350 varieties of North American tree. In many forests, this deciduous tree grows straight and tall, to 28 m (92 ft), exceptionally to 43 m (141 ft) tall, with a trunk of up to 50–100 cm (20–39 in) diameter. Open-grown trees do not get as tall, but can develop a stouter trunk, up to 2 m (6.6 ft) in diameter. It has stout branches growing at right angles to the stem, forming a narrow round-topped head. It grows rapidly and is tolerant of many soils and varied situations, although it prefers the glacial drift and well-drained borders of streams. It is frequently a part of the canopy in an oak-heath forest, but generally not as important as some other oaks. Under optimal conditions and full sun, northern red oak is fast growing and a 10-year-old tree can be 5–6 m (16–20 ft) tall. Trees may live up to 400 years according to the USDA and a living example of 326 years was noted in 2001 by Orwig et al. Northern red oak is easy to recognize by its bark, which features bark ridges that appear to have shiny stripes down the center. A few other oaks have bark with this kind of appearance in the upper tree, but the northern red oak is the only tree with the striping all the way down the trunk. Bark: Dark reddish grey brown, with broad, thin, rounded ridges, scaly. On young trees and large stems, smooth and light gray. Rich in tannic acid. Branchlets slender, at first bright green, shining, then dark red, finally dark brown. Bark is brownish gray, becoming dark brown on old trees. Wood: Pale reddish brown, sapwood darker, heavy, hard, strong, coarse-grained. Cracks in drying, but when carefully treated could be successfully used for furniture. Also used in construction and for interior finish of houses. Sp. gr., 0.6621; weight of cu. ft., 41.25 lbs. Leaves: Alternate, seven to nine-lobed, oblong-ovate to oblong, five to ten inches long, four to six inches broad; seven to eleven lobes tapering gradually from broad bases, acute, and usually repandly dentate and terminating with long bristle-pointed teeth; the second pair of lobes from apex are largest; midrib and primary veins conspicuous. Lobes are less deeply cut than most other oaks of the red oak group (except for black oak which can be similar). Leaves emerge from the bud convolute, pink, covered with soft silky down above, coated with thick white tomentum below. When full grown are dark green and smooth, sometimes shining above, yellow green, smooth or hairy on the axils of the veins below. In autumn they turn a rich red, sometimes brown. Often the petiole and midvein are a rich red color in midsummer and early autumn, though this is not true of all red oaks. The acorns mature in about 18 months after pollination; solitary or in pairs, sessile or stalked; nut oblong-ovoid with broad flat base, full, with acute apex, one half to one and one-fourth of an inch long, first green, maturing nut-brown; cup, saucer-shaped and shallow, 2 cm (0.79 in) wide, usually covering only the base, sometimes one-fourth of the nut, thick, shallow, reddish brown, somewhat downy within, covered with thin imbricated reddish brown scales. Its kernel is white and very bitter. Despite this bitterness, they are eaten by deer, squirrels and birds. Red oak acorns, unlike the white oak group, display epigeal dormancy and will not germinate without a minimum of three months' exposure to sub-40 °F (4 °C) temperatures. They also take two years of growing on the tree before development is completed. Quercus rubra has effective ectomycorrhizal relationships that have been correlated with increased growth rates. Northern red oak trees have been shown to increase growth in the presence of various ascomycetes that coil at the base of the oak trunk. The fungi, which eventually proliferate at the stumps of deciduous trees, have been found to be host-specific to both Quercus rubra and Quercus montana and primarily promote growth upon infection. The northern red oak is one of the most important oaks for timber production in North America. Quality red oak is of high value as lumber and veneer, while defective logs are used as firewood. Other related oaks are also cut and marketed as red oak, although their wood is not always of as high a quality. These include eastern black oak, scarlet oak, pin oak, Shumard oak, southern red oak and other species in the red oak group. Construction uses include flooring, veneer, interior trim, and furniture. It is also used for lumber, railroad ties, and fence posts. Red oak wood grain is so open that smoke can be blown through it from end-grain to end-grain on a flat-sawn board. For this reason, it is subject to moisture infiltration and is unsuitable for outdoor uses such as boatbuilding or exterior trim. 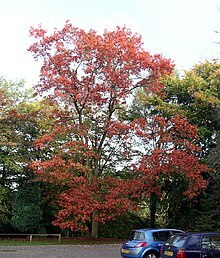 Quercus rubra is grown in parks and large gardens as a specimen tree. It is not planted as often as the closely related pin oak as it develops a taproot and quickly becomes difficult to transplant. Acorns should either be sown in the location where the tree is intended to be planted or else moved to their permanent location within the seedling's first year. As the tree gets older, the taproot gradually becomes less dominant and the lateral root network expands. Northern red oak is easy to start from seed, however the acorns must be protected from animal predation over the winter months. As with other oaks, germination takes place in late spring when all frost danger has passed. The seedling grows rapidly for its first month, then pauses for another month, and sends out more new shoots until September when growth stops for the year. If the weather stays favorable, a third burst of growth may occur. Across western and central Europe, the northern red oak has become the fourth-most significant invasive species, colonizing several regions across Poland, Belgium, Ukraine and Lithuania. The northern red oak is primarily found on the edges of woodland reserves in Europe, where light availability, tannin concentration, and animal dispersal are the most necessary component for the species' longevity and survival. The high influx of the species in Europe is primarily based on its economic productivity as a fast-growing source of timber; however, it has been linked to lower percentages of trace elements and minerals found in the surrounding soil and reduced richness among native oak species such as Quercus robur. Over the last few decades, the northern red oak has dealt with several environmental factors, mainly disease, predation by insects, and limited opportunities for dispersal. These stresses have impacted the species' ability to proliferate in both the Northeast and Europe. The various environmental responses observed in Quercus rubra across several temperate environmental conditions have allowed for it to serve as a model organism for studying symbiotic relationships, dispersal, and habituation between tree species. Canker pathogen, Diplodia corticola, has become a major pathogen to the species over the last decade, causing leaf browning, bark cracking and bleeding, and high rates of tree mortality across the northeastern United States. The northern red oak is also characterized as one of the most susceptible species to plant fungi Phytophthora cinnamomi and Phytophthora ramorum, which have caused severe, red-black cankers in the trunk region of the species. Both P. cinnamomi and P. ramorum grow under warmer temperature conditions; as a result, northern red oak trees found in California, France, and northern Spain all have higher incidences of fungal infection. Northern red oak seedlings have been known to have a high mortality rate in northeast regions prone to spring freeze, particularly in Massachusetts. Acorns produced by oaks in this region are typically smaller in size as an adaptation to frost produced in high latitudes; however, the resulting smaller seedlings have produced limited opportunities for animal consumption and dispersal. Flooding along the continental United States has been shown to be a major issue for the northern red oak, in which decreased phloem transport and photosynthetic activity has been observed, but only after multiple days of flooding, indicating that the northern red oak has adapted moderate resistance to excess water exposure. The northern red oak has also developed tolerance mechanisms for heat stress, particularly observed in deciduous forests in the Southeastern United States, where, during summer heat waves, temperatures can exceed 40 °C. The leaves of the northern red oak have been observed to have an acclimation to Rubisco activase activity that is directly correlated to acclimations with repeated exposure to heat waves. Consistent photosynthetic activity in the red oak has also been observed in the presence of high carbon dioxide levels that often occur as a result of elevated temperatures. In Europe, northern red oak acorns have become food of several moth species, particularly Cydia fagiglandana and Cydia splendana, which increases their niche breadths and reduces their competition with Curculio weevils. Due to this, germination rates among the northern red oak acorns have decreased significantly and resulted in less seed dispersal by animals within Poland. In addition, limited opportunities for dispersal have become costly for the northern red oak in Europe. European animals known for dispersing tendencies, such as the European jay and wood mouse, have been found to be more attracted to local oak species. Northern red oak kernels have highly concentrated amounts of tannin, a biochemical known as a predator deterrent and produce a bitter taste, which has limited appeal for consumption among animal species. Ashford Oak – A very large Northern Red Oak in Ashford, Connecticut. The tree has suffered falling limbs because of its great age. However, this tree is still a sight to behold; the trunk is 8 m (26 ft) in circumference and the root-knees are also particularly impressive. The oak is located on Giant Oak Lane off U.S. Highway 44. There are several other large oaks in the area. Shera-Blair Red Oak – This majestic red oak tree is located on Shelby Street in the South Frankfort neighborhood in Franklin County, Kentucky, and is the largest red oak tree in the oldest neighborhood in Frankfort, Kentucky. It is in the backyard of a house built in 1914 by architect Arthur Raymond Smith, who at one time worked for D.X. Murphy & Bros., famed architects that designed the twin spires at Churchill Downs. The circumference at breast height is 6.4 m (21 ft), with the trunk reaching higher than 40 feet before the branches begin and an estimated height of 130 feet. ^ "Quercus rubra". NatureServe Explorer: An online encyclopedia of life, Version 6.1. Arlington: NatureServe. 2006. Retrieved 2007-06-13. ^ "Quercus rubra". County-level distribution map from the North American Plant Atlas (NAPA). Biota of North America Program (BONAP). 2014. ^ a b Keeler, Harriet L. (1900). Our Native Trees and How to Identify Them. New Roak: Charles Scriber's Sons. pp. 349–354. ^ a b c d e f Nixon, Kevin C. (1997). "Quercus rubra". In Flora of North America Editorial Committee. Flora of North America North of Mexico (FNA). 3. New York and Oxford – via eFloras.org, Missouri Botanical Garden, St. Louis, MO & Harvard University Herbaria, Cambridge, MA. ^ a b Dickie, Ian A.; Koide, Roger T.; Steiner, Kim C. (2002). "Influences of Established Trees on Mycorrhizas, Nutrition, and Growth of Quercus rubra Seedlings". Ecological Monographs. 72 (4): 505–521. doi:10.2307/3100054. JSTOR 3100054. ^ "Quercus rubra". RHS Gardening. Royal Horticultural Society. Retrieved 27 June 2013. ^ a b Wagner, Viktoria; Chytrý, Milan; Jiménez-Alfaro, Borja; Pergl, Jan; Hennekens, Stephan; Biurrun, Idoia; Knollová, Ilona; Berg, Christian; Vassilev, Kiril (2017-09-01). "Alien plant invasions in European woodlands". Diversity and Distributions. 23 (9): 969–981. doi:10.1111/ddi.12592. ISSN 1472-4642. ^ Riepas, Edvardas (2008). "Invasiveness and ecological effects of red oak (Quercus rubra) in Lithuanian forests" (PDF). Baltic Forestry. 14: 122–130. ^ Woziwoda, Beata; Kopeć, Dominik; Witkowski, Janusz (2014-03-18). "The negative impact of intentionally introduced Quercus rubra L. on a forest community". Acta Societatis Botanicorum Poloniae. 83 (1): 39–49. doi:10.5586/asbp.2013.035. ISSN 2083-9480. ^ Smith, Sally E.; Read, David J. (2010-07-26). Mycorrhizal Symbiosis. Academic Press. ISBN 9780080559346. ^ Top, Sara M.; Preston, Caroline M.; Dukes, Jeffrey S.; Tharayil, Nishanth (2017). "Climate Influences the Content and Chemical Composition of Foliar Tannins in Green and Senesced Tissues of Quercus rubra". Frontiers in Plant Science. 8: 423. doi:10.3389/fpls.2017.00423. ISSN 1664-462X. PMC 5432568. PMID 28559896. ^ Marĉais, B.; Dupuis, F.; Desprez-Loustau, M. L. (1996-06-01). "Susceptibility of the Quercus rubra root system to Phytophthora cinnamomi; comparison with chestnut and other oak species". European Journal of Forest Pathology. 26 (3): 133–143. doi:10.1111/j.1439-0329.1996.tb00718.x. ISSN 1439-0329. ^ Bergot, Magali (2004). "Simulation of potential range expansion of oak disease caused by Phytophthora cinnamomi under climate change". Global Change Biology. 10 (9): 1539–1552. doi:10.1111/j.1365-2486.2004.00824.x. ^ a b Davidson, J. M.; Werres, S.; Garbelotto, M.; Hansen, E. M.; Rizzo, D. M. (2003). "Sudden Oak Death and Associated Diseases Caused by Phytophthora ramorum". Plant Health Progress. 4: 12. doi:10.1094/php-2003-0707-01-dg. ^ Marcais, B (June 1995). "Modelling the influence of winter frosts on the development of the stem canker of red oak, caused by Phytophthora cinnamomi" (PDF). Annales des Sciences. 53: 369–382. ^ Aizen, Marcelo (1996). "Effects of acorn size on seedling survival and growth in Quercus rubra following simulated sporing freeze" (PDF). Canadian Journal of Botany. 74: 308–314. ^ Sloan, Joshua L.; Islam, M. Anisul; Jacobs, Douglass F. (2016-01-01). "Reduced translocation of current photosynthate precedes changes in gas exchange forQuercus rubraseedlings under flooding stress". Tree Physiology. 36 (1): 54–62. doi:10.1093/treephys/tpv122. ISSN 0829-318X. PMID 26655380. ^ Bauweraerts, Ingvar; Ameye, Maarten; Wertin, Timothy M.; McGuire, Mary Anne; Teskey, Robert O.; Steppe, Kathy (2014-07-01). 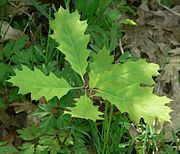 "Acclimation effects of heat waves and elevated [CO2] on gas exchange and chlorophyll fluorescence of northern red oak (Quercus rubra L.) seedlings". Plant Ecology. 215 (7): 733–746. doi:10.1007/s11258-014-0352-9. ISSN 1385-0237. ^ Cavender-Bares, J.; Potts, M.; Zacharias, E.; Bazzaz, F. A. (2000-12-01). "Consequences of CO2 and light interactions for leaf phenology, growth, and senescence in Quercus rubra". Global Change Biology. 6 (8): 877–887. CiteSeerX 10.1.1.337.1253. doi:10.1046/j.1365-2486.2000.00361.x. ISSN 1365-2486. ^ Myczko, Łukasz; Dylewski, Łukasz; Chrzanowski, Artur; Sparks, Tim H. (2017-08-01). "Acorns of invasive Northern Red Oak (Quercus rubra) in Europe are larval hosts of moths and beetles". Biological Invasions. 19 (8): 2419–2425. doi:10.1007/s10530-017-1452-y. ISSN 1387-3547. ^ Merceron, Natalie (2017). "Removal of acorns of the alien oak Quercus rubra on the ground by scatter-hoarding animals in Belgian forests". Biotechnology, Agronomy, Society, and Environment. 21: 127–130. Wikimedia Commons has media related to Quercus rubra.